There is nothing better than just the constant application of lipgloss (or Lip Glaze), especially when the weather is dry or you want to be casual with just a hint of shine. I usually have about 5 or more on-hand, in constant rotation and apply them throughout the day. I may be a little bit of an addict. I like to share my favorite with the hope that you will share yours, fueling my consumption! 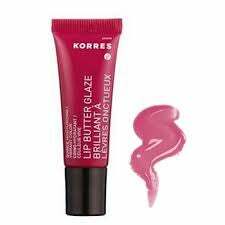 Currently, I'm a big fan of Korres Lip Butter Glaze, which I got in a set of 5 colors. I love Korres period—it's one of my favorite lines but I particularly adore this product. It feels smooth and smells nice. It's also subtle with a hint of color and is fairly long lasting. Another favorite was Stila Lipglaze, which I got in a set before. The applicator was a little more cumbersome but the color was sparkly, especially as the light hit, which is what I love the most. Not as moisturizing as Korres, so you still need your chapstick. Finally, on the economical end of the spectrum, C. O. Bigelow Mentha Shimmer Lip looks shiny and smooth and even more so, feels and tastes minty and delicious. I love the dark color as well. What say you about your favorite Lip Gloss/Glazes and other such things that are not lipsticks?